I am currently publishing two newsletters. The first is a weekly newsletter called, "Ask The Computer Lady", and the second, "Ask The Computer Lady - Tablet Edition", comes out twice a month with lessons for you to follow. 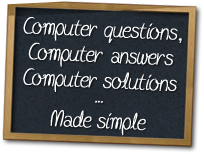 If you have Computer Questions, you can learn quick & easy answers every Thursday in my FREE newsletter called, Ask The Computer Lady! I'll teach you how to save time and money when it comes to your computer. You will gain valuable computer knowledge and your friends will soon be coming to you for computer advice. We have all been there, you find yourself repeating the same tasks day after day on your computer, and while you know there has to be a quicker, easier way, you don't know how so you keep doing it the same, long way. I have done things the long hard way too, but then I began to search through books, courses and the Internet and found there are shortcuts out there that I didn't even know I should be looking for. Before long, I was doing twice the work on my computer in half the time! While I was searching and learning, I began to notice one small thing. All these resources were written in technical language that was hard for the average computer user to understand. Sure, I found a few sites written for "Newbies" but they treated me like I was a bit... slow. I felt insulted after researching their sites! This is why I write Ask The Computer Lady every week in simple, easy to understand language that does not insult the intelligence of my readers. Not only do my readers learn from me, but I often learn new shortcuts and tip from many of you! Don't just take my word for it. Take a look at the column on the right to see what some of my weekly readers have to say! Do you have a new tablet? Do You Dread the Thought of Learning How to Use yet Another Device? Start Learning How To Use Your tablet With Confidence. All You Need To Do Is Subscribe To My FREE newsletter, Ask The Computer Lady Tablet Edition! I’ll teach you how to save time and money when it comes to your tablet. You will learn solid skills that will allow you to use your tablet with confidence. I write Ask The Computer Lady -Tablet Edition in simple, easy to understand questions and answers that do not insult the intelligence of my readers. I will show you how things work with these clear cut tutorials. You will gain solid skills as you read the tips, tricks and shortcuts that make using your tablet easier and faster. You will also gain confidence as you learn key tasks and techniques. What are people saying about my newsletters? I subscribe to, and have read, many, many computer newsletters Yours is the first to be explained in terms the average person can understand with quality, correct information that goes directly to the point.YOU DUN GOOD KID! I can hardly wait to see your newsletter each time you publish it. I save almost every one of your answers to people's problems and file them in a loose-leaf notebook just in case someone else (or I) need an answer in the future. Thanks so much for having such a wonderful newsletter, and for free at that! Hi Elizabeth, I feel as though I know you personally, due to the fact that your newsletter writes as though you were sitting beside me and we are having a conversation. You have a Gift and you have helped so many of us, especially like me, I'm 72 and spend most of my spare time "grin', on the computer trying your recommended sites and enjoying every minute of it. Thanks so much for all you do and your continued interest in helping others. GOD BLESS YOU!